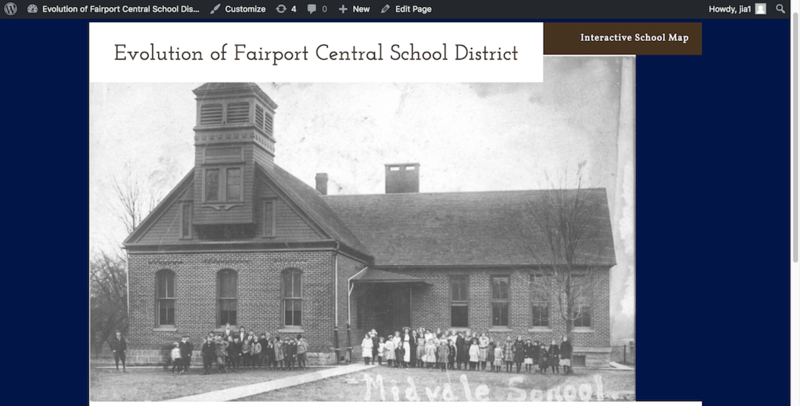 With this project, I sought to compare the spread of district schools in Perinton to that of the centralized schools in Fairport, New York. Construction of the Erie Canal was completed in 1825 in New York state. The man made waterway runs through Perinton. The completion of this canal led to surging population increases in Perinton and the need to develop a school system. I utilized the digital program Google MyMaps to expand my project. Google MyMaps is an expansion of Google Maps which allows users to expand on face value information provided in the maps, and implement their own metadata. Users can select an established point or location, or add a new point to the map. After adding a point, it is possible to add pictures and descriptions. Symbols are important to maps, and they can represent what stands at a location. 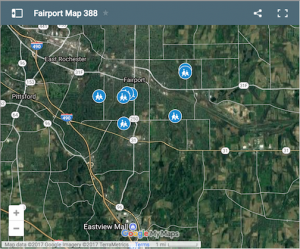 MyMaps provides dozens of icons with hundreds of color combinations to clarify what different types of structures and land are present at different locations. I plotted locations of the eleven Perinton district schools used in the 19th and 20th centuries, and added metadata to these points. Pictures of some of these buildings were available to me so I implemented these visuals. Additionally, I wrote brief captions and explanations of these schools. This layer is entitled “Old Schools”. The separate layer of the map I filled is the “Current Schools” layer. Users can select and deselect the layers to view and compare locations of the school buildings that have been utilized within the town over the years. I hosted my project through a WordPress installation I worked on in English 388. Using the “Hotel” theme, I wanted to make my website accessible and easy to navigate. 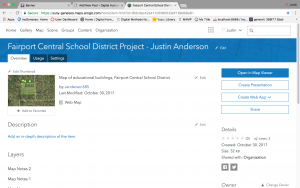 The “Interactive School Map” post on my WordPress contains the MyMap project as well as a detailed explanation of the information contained. I wanted to make sure my website is accessible to anybody, and user friendly. I think it is important to preserve history digitally. Where traditional humanities practices in history may fail to protect documents and ensure that they are accessible, a digital host for information is within reach for a much larger audience. Additionally, the ability for an audience to interact with a project and draw their own conclusions objectively is quite important in its own right. I enjoyed my time and work invested into this project and my overall studies in “Digital Methods for Humanists” with Dr. Schacht. Though I am a novice when it comes to technology, this course has broadened my skill set and showed me ways that digital tools can support studies and work in the Humanities field. My DH project is interconnected with my research in Dr. Steet’s INTD 203: Social Foundations of American Education. I am looking into the impact of the Erie Canal’s construction on population redistribution in Western New York. Specifically, I am analyzing the connection between the construction of the canal, and the growth of the town of Perinton, which contains the village of Fairport. Known as the “Crown Jewel of the Erie Canal,” Fairport is a village which grew economically dependent on the manmade waterway. The Establishment of the canal led to the construction of numerous schools throughout the area, which eventually became centralized in the 20th century. I plan to use mapping and timeline tools to show the evolution of the village and town. I am currently using arcgis online mapping to plot educational points of interest in my home town. 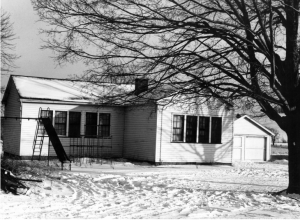 A few notable educators of Fairport were educated at schools along the canal, and returned home to teach following teacher education at Geneseo Normal School. 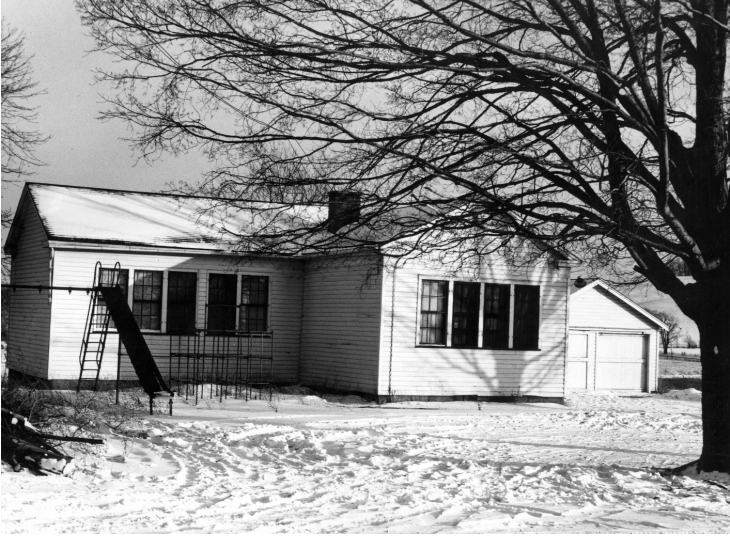 Perinton saw a few stages of development in education structure, from one room schoolhouses to one centralized district. These changes were brought about by multiple notable events, and I am making chronological maps to display these developments next to each other. One area where I have encountered difficulty is the implementation of a timeline. I have not yet decided if I will make a separate, interactive timeline to present next to my maps. I am learning more about arcgis and will potentially download their software to use in place of their online hosting. Within arcgis online, a user can outline areas on a map and add layers to add metadata. 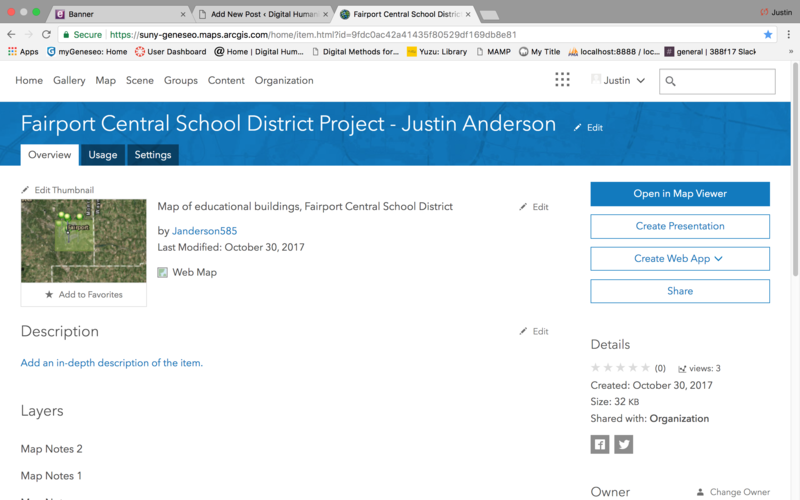 I have added points to my map at the current schools in the district with various pieces of information. I have looked into layering a few maps on top of each other to allow for quick transitions. This is a work in progress, and I will continue to add to my maps as I collect more data.